I'm not sure if this is my favorite food article from the year, but it certainly was one of the more unique dishes that I tried this year. When you couple The King's uniqueness with the fact that the missus and I made our first pilgrimage to Graceland this past autumn, and I can't come up with a single reason why I shouldn't feature this royal cupcake as our best Epicurean Display article of 2013! This Friday is the thirty-sixth anniversary of the loss of The King. Famously known for his crooning and gyrating, Elvis Presley was also known for his favorite foods. 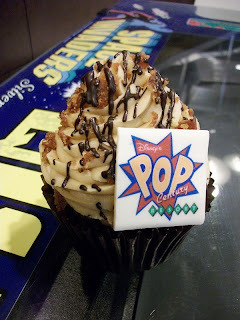 In celebration of the life and times of this rock‘n’ roll legend Pop Century’s Everything Pop crafted a cupcake for Elvis last year. 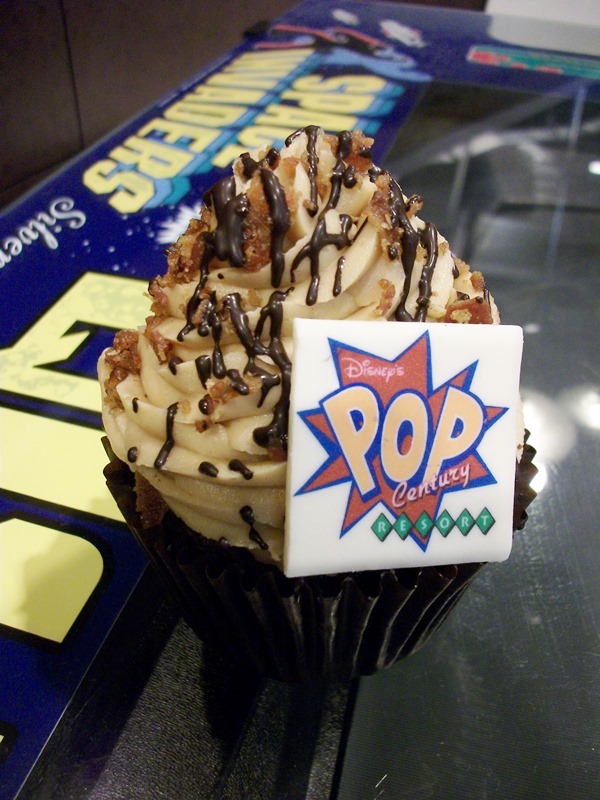 The King, as the cupcake is known, features a chocolate cupcake base with banana custard filling. The frosting is peanut butter topped with candied bacon bits and chocolate drizzle. The banana custard was the most surprising part of the cupcake, as the custard used real banana in the custard. For those who love the idea of chocolate and banana, the main portion of this dessert will hit you right in your comfort zone. Then again, if you are more of a chocolate and peanut butter fan, you are not going to be disappointed either! Provided, that is, that you can unhinge your jaw in order to take a chunk out of this behemoth cupcake. If I had to offer up some criticism of The King, it comes from the ingredient I was most looking forward to, the candied bacon. The bacon used for the crumble topping is the thin, wimpy breakfast variety. A thicker cut of bacon would definitely bring out the sweet and savory combination that the candied bacon could and should be. This weekend let loose your inner Lilo & Stitch, crank up the Elvis tunes that make you want to move, and indulge a little with The King!